Microbial fuel cells have gained popularity as a viable, environmentally friendly alternative for the production of energy. However, the challenges in miniaturizing the system for application in smaller devices as well as the short duration of operation have limited the application of these devices. Here, the capillary motion was employed to design a self-pumped paper-based microbial fuel cell operating under continuous flow condition. A proof-of-concept experiment ran approximately 5 days with no outside power or human interference required for the duration of operation. Shewanella oneidensis MR-1 was used to create a maximum current of 52.25 µA in a 52.5 µL paper-based microfluidic device. SEM images of the anode following the experiment showed biofilm formation on the carbon cloth electrode. 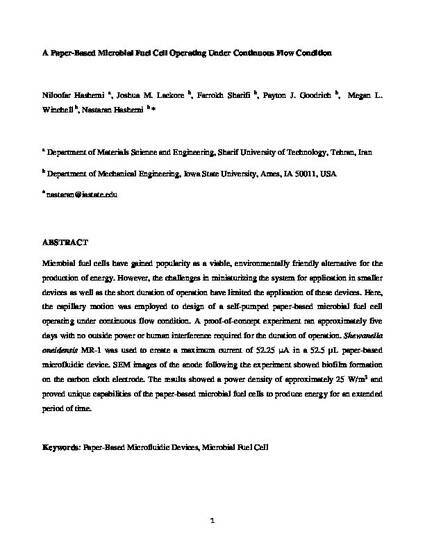 The results showed a power density of approximately 25 W/m3 and proved unique capabilities of the paper-based microbial fuel cells to produce energy for an extended period of time. Electronic version of an article published as Hashemi, Niloofar, Joshua M. Lackore, Farrokh Sharifi, Payton J. Goodrich, Megan L. Winchell, and Nastaran Hashemi. "A paper-based microbial fuel cell operating under continuous flow condition." Technology 4, no. 2 (2016): 98-103. DOI: 10.1142/S2339547816400124. Copyright World Scientific Publishing Company. https://www.worldscientific.com/worldscinet/technology. Posted with permission.